A couple of shots of my new pen case (with double-skulls!!!) 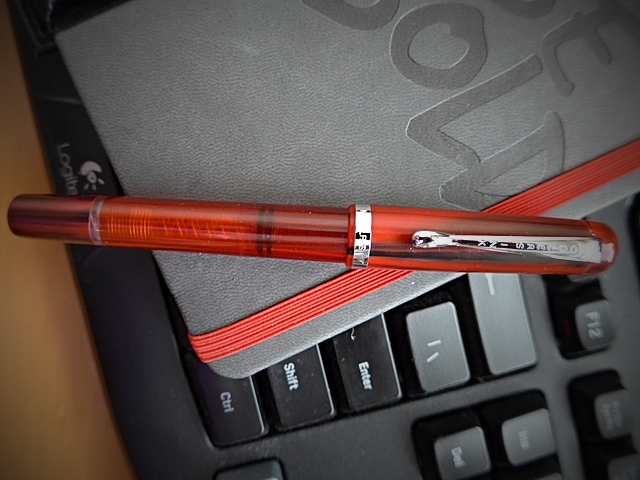 from eBay and my new Noodler's 'Konrad' fountain pen in the "Cardinal Darkness"---love that name---pattern. The Konrad is a lightweight fountain pen, but is chunky and very comfortable to hold. It was originally made of a celluloid derivative, but acrylic models and ones made of ebonite (both of which are slightly larger than the celluloids) were later added to the lineup. All of the Konrad models come with a large, flexible steel nib that can provide line variation. It should be noted, however, that the flex is not quite as dramatic as that produced with some older vintage pens with gold nibs. It's a fun pen to use, though, and if you ever get a hankering to take it apart for a very thorough cleaning, you can do so without any tools. 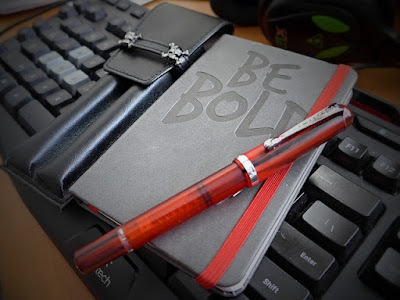 I have a few Konrads (mostly purchased locally from Perks ) but I got this one online from The Birmingham Pen Company in (...wait for it...) Pittsburgh, Pennsylvania. They come in a multitude of colours and patterns, so if you're looking for a low-budget, well-made, piston-filling fountain pen with good ink capacity (~ 1.1mL), give it a try!